China no longer owns the fastest supercomputer in the world; It is the United States now. Summit is claimed to be more than twice as powerful as the current world leader with a peak performance of a whopping 200,000 trillion calculations per second—that's as fast as each 7.6 billion people of this planet doing 26.3 million calculations per second on a calculator. Until now the world's most powerful supercomputer was China's Sunway TaihuLight with the processing power of 93 petaflops (93,000 trillion calculations per second). Since June 2012, the U.S. has not possessed the world's most powerful supercomputer, but if Summit performs as claimed by IBM, it will be made straight to the top of the Top500 supercomputer list which will be published later this month. In the most recent Top500 list of the world's top supercomputers, published in November 2017, China still has more supercomputers with the US owned 143 of the top 500 while China owned 202. 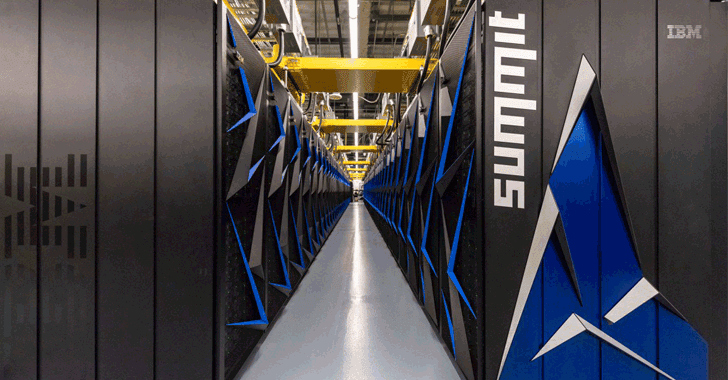 Housed at Oak Ridge National Laboratory (ORNL) in Tennessee, Summit is developed by IBM in collaboration with Nvidia, RedHat, and InfiniBand networking specialists Mellanox and cost $200 million to build. Summit consists of 4,608 compute servers, each of which has two IBM Power9 CPUs running at 3.1GHz with 22 processing cores running in parallel. That's over 200,000 CPU cores across all of Summit. Each pair of Power9 chips is connected to six Nvidia Tesla V100 graphics chips (GPUs). In total, the system also features more than 10 petabytes of memory (RAM). The ORNL team says Summit is the first supercomputer made bespoke for use in artificial-intelligence (AI) applications, like machine learning and neural networks. "Summit's AI-optimized hardware also gives researchers an incredible platform for analyzing massive datasets and creating intelligent software to accelerate the pace of discovery," Jeff Nichols, ORNL associate laboratory director for computing and computational sciences, said in today's announcement. However, the ORNL team says Summit's initial uses will include work on astrophysics, cancer research, fusion energy, and addiction treatment. IBM is also building a smaller version of Summit called Sierra, which is scheduled to go online this year at the Lawrence Livermore National Laboratory. Sierra is less powerful than Summit with only four V100 GPUs per node for maximum processing capacity of around 125 petaflops.